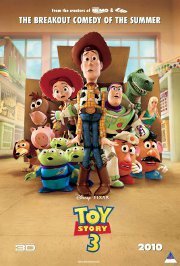 The second sequel to Toy Story lands the toys in a room full of untamed tots who can't wait to get their sticky little fingers on these 'new' toys. It's pandemonium as they try to stay together, ensuring 'no toy gets left behind.' Meanwhile, Barbie comes face to face with Ken... Note this movie is showing in 2D and 3D versions, this is the 2D version. Eenie, meenie, mynie, mo... one of you just has to go.